Facebook’s (s fb) upgrade to its Nearby mobile feature was framed as a Foursquare killer by some with its ability to provide local search, recommendations and information. But in trying out Nearby, Foursquare still comes out on top for me as a local search tool. That’s to be expected when you consider all the investments Foursquare has made in local but it shows how much Facebook needs to do to get competitive in local search. And this is not even considering comparisons to Yelp (s yelp) and Google (s goog), which are also strong local search tools. This might be comforting for Foursquare but the location-based service doesn’t have Facebook’s reach and many people still don’t see it as a local search tool. Foursquare’s will have to work to stay ahead of Facebook and more importantly, turn people on to its local search and recommendation engine Explore. 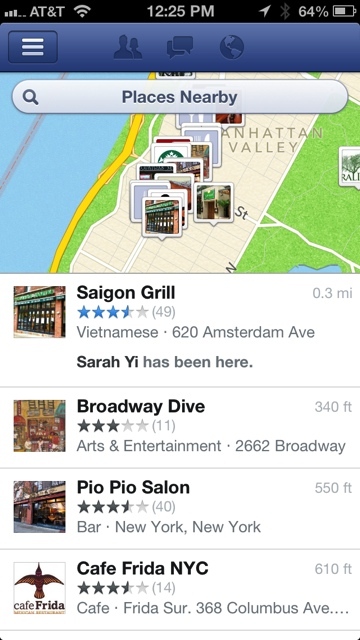 Facebook Nearby, a menu tab within Facebook’s mobile apps and websites, offers a tool for finding places, both nearby and across a larger area. It loads up recommendations first with venues that friends have visited, recommended or liked. With Facebook’s much bigger user base, that should provide a lot of signals over Foursquare, which has just 25 million registered users. But it’s not that big of an edge in most cases because a lot of people haven’t tagged their updates with locations or interacted with businesses on Facebook. You can browse for nearby stuff or look across different categories like restaurants, coffee, nightlife, shopping, outdoors. But it’s when you start actually searching for stuff that you realize Facebook still has more work to do. I searched for “sushi” in my neighborhood and the second listing was for a steakhouse and barbecue restaurant. On my map, I was only shown two restaurants within ten blocks of me. On Foursquare, I found ten restaurants in the same area including my favorite, which didn’t even show up on Facebook. A business needs to have a Facebook Page to show up on Nearby. Some listings appear to be automatically generated but others businesses will need to get on Facebook to make Nearby really useful for users. Facebook also sometimes struggles with multiple pages for one location and doesn’t pick up new restaurants that fast. The company said that it will also be incorporating more third-party data so this should improve soon. I think Lockbreaker is the Foursquare killer… evidently it crushed Foursquare in market share in Central PA (where Lockbreaker is located at). Facebook is the “Walmart” of the social media segment. In the not to distant future features of social media will become more important and it will be impossible for one site to collaborate all your social media needs.